It is plain from the contents of Antonio Neri's book about glassmaking, that he was very careful about the purity of his ingredients. In fact, is not too strong to say he was obsessive—and for an alchemist, this turns out to be a very useful trait. It means that he was paying close attention to the materials he used. That alone, went a long way to ensuring consistent results in his preparations. Exactly how filtering, purification and the physical processing of materials were done in the early seventeenth century provides some fascinating insight into the technology of the time. It also demonstrates that his results were as least as good as what can be accomplished today with modern equipment, albeit at a considerably slower pace. Many of these techniques were based on the clever use of water. Enamels are a type of glass, which is used in very thin layers over metal or sometimes on glass items as a decoration. They are "painted" on an article and then fired over a flame or in a kiln where they fuse and become permanent. When applied by a skilled artist, enamels can be made to form images like a fine painting, but very durable. 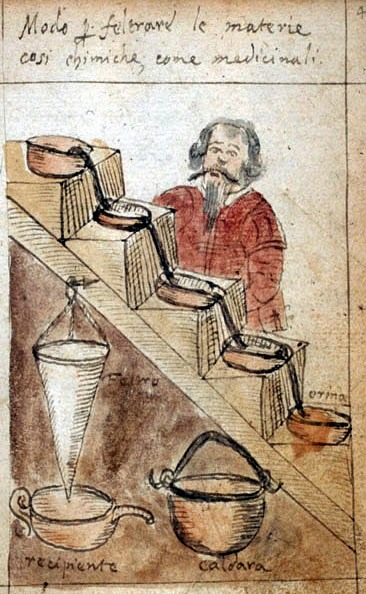 In the recipes for his enamels, Neri requires that tin and lead oxides be blended together, but he wants them to take the form of extremely fine powder, much finer than what could be produced by a sieve. The way he achieves this is to put the powders in water. They are not soluble, but what happens is the larger particles settle to the bottom while the finest ones remain suspended in the water, giving it a milky appearance. After a prescribed interval, he carefully pours off (decants) the liquid into another vessel, leaving the heavier sediment behind. He then evaporates the liquid over a low fire, effectively having separated out the very finest components of the powder. He used a variation of this method to purify materials that are soluble, like the glass salt that he made from plants. Lightly charred plants, ferns for example, were boiled in water. In this case, any contaminants that did not dissolve settled out and the remaining liquid was evaporated, leaving purified product. In other recipes, he dissolves metals in acid to achieve the same effect; many impurities did not dissolve and were left behind. It is a very basic method, yet extremely effective. It was also a part of his chemical philosophy. 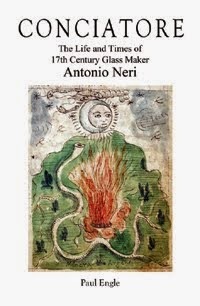 In the introduction to the glass book, Neri makes reference to work he did in the 'spagyric' arts. In his unpublished writings, he elaborates on this further. Paracelsus coined the word ‘spagyric’ in his book Liber Paragranum, where he argues medicine should be based solely on the physical laws of nature. The word derives from two Greek terms: 'spao' meaning to separate, and 'ageiro' meaning to combine. The underlying philosophy recurs throughout the history of alchemy. To enhance the special properties of a material, break it down, to its separate constituents, then purify each and recombine them for a more potent product. Herein lay the bones of Neri's empirical methodology. It has a frame built on the processes of reduction, purification and recombination. Fleshed out with skilful hands, these methods show up consistently throughout his glass recipes. He successfully utilizes the technique with both plant and mineral ingredients, in the preparation of basic materials and pigments, and throughout his medicinal work.